ANN ARBOR – The cyanobacteria blooms that plague western Lake Erie each summer are both an unsightly nuisance and a potential public health hazard, producing liver toxins that can be harmful to humans and their pets. The UM researchers plan follow-up studies to see if the protective effects they observed in the lab are also occurring in lakes. They’ll also explore the potential of using the chemicals to develop anti-fungal drugs for human use. The study was published Tuesday, Jan. 15 in the journal Proceedings of the Royal Society B. The first author is Kristel Sánchez, who did the work for her master’s thesis in the UM Department of Ecology and Evolutionary Biology. Co-authors include her faculty advisers, UM ecologists Mark Hunter and Meghan Duffy. The lab-reared Daphnia in the UM study were then exposed to one common fungal parasite and one common bacterial parasite. 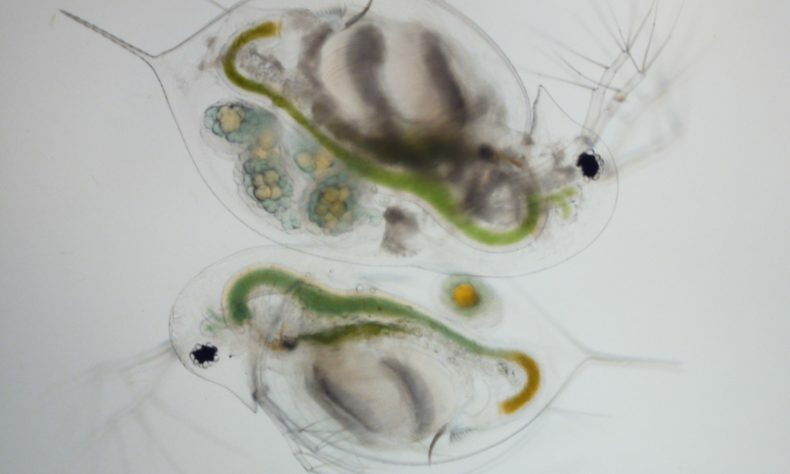 In the wild, Daphnia become infected by consuming parasite spores in the water. Two of the cyanobacteria diets – including the diet treatment in which pure microcystin was added to beakers containing Microcystis cultures – completely prevented fungal infections. The diet of Microcystis alone, without additional microcystin, resulted in very low levels of fungal infection. The other author, in addition to Sánchez, Duffy and Hunter, is former UM undergraduate Naomi Huntley, who worked in Duffy’s lab. The research was supported by grants from the UM Department of Ecology and Evolutionary Biology and EEB’s Frontiers Master’s Program, which fosters diversity in science. The research was also supported by grants from the U.S. National Science Foundation to Duffy and Hunter.